We look at how the salaries of assignees coming into and out of the US will be affected by the recent tax reform there. In June 2017 we reported that the Trump administration had released an ambitious income tax plan that, if enacted, would greatly simplify the US tax system and impact both inbound and outbound assignees. There were no real public developments in the months that followed, until the House of Representatives (House) released the Tax Cuts and Jobs Act on 2 November, a draft bill containing several provisions in line with the announcement made six months earlier. This was passed on 16 November, but in the meantime the Senate released its own version, which was passed on 2 December. A bill reconciling the two (with the slightly-less-memorable name ‘To provide for reconciliation pursuant to titles II and V of the concurrent resolution on the budget for fiscal year 2018’) was passed by the Senate and House on 19 and 20 December respectively, and subsequently signed into law by President Trump on 22 December. What are the significant changes affecting assignees? Budgetary rules and constraints mean that the above provisions will expire after 2025, after which the old legislation applies. There is of course nothing to stop them being extended or made permanent in the future, but for now these changes are temporary. What is the impact on remuneration packages? Tax reform around the world has typically been austere in recent years, and it has been rare to see high-earners among the beneficiaries. This legislation appears to buck the trend; in a surprising twist, the reconciled bill reduced the top marginal tax rate for all filers from 39.6% to 37% despite both the House and Senate originally opting to leave it unchanged. Furthermore, the significant increases in the phasing-out thresholds for AMT and Child Tax Credits arguably benefit those who don’t really need them. However, not everyone will benefit from the changes. Under the US system, taxpayers choose between claiming the standard deduction or itemised deductions, which include elements such as state tax due, medical expenses and mortgage interest payments. The new legislation has significantly increased the standard deduction but repealed several itemised deductions and limited others. 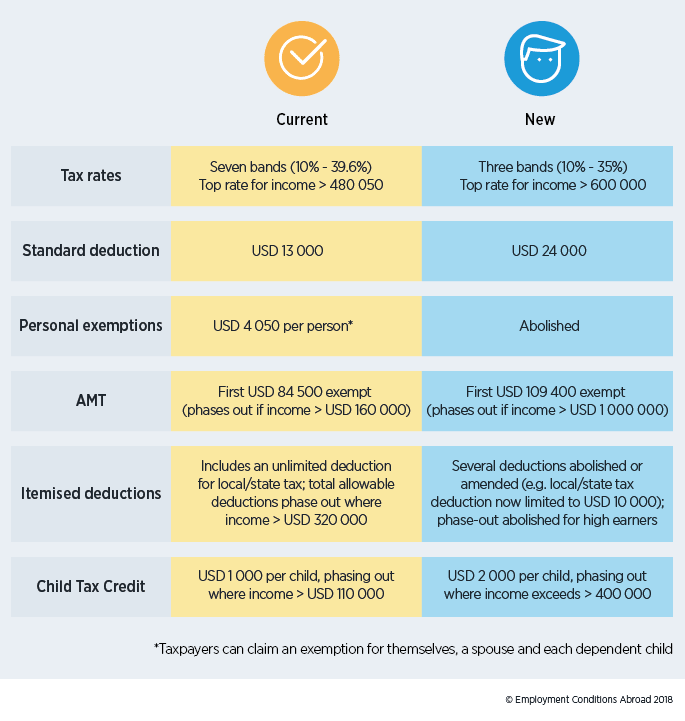 For example, the state and local tax deduction was previously unlimited but now a ceiling of USD 10 000 (USD 5 000 if married and filing separately) applies. Therefore, an individual residing in a high-tax state such as New York, or who previously claimed many itemised deductions, could potentially be made worse off by the changes. The abolition of the itemised deduction phase-out (known as the Pease Limitations) could offset some of this loss for high earners. Such individuals are unlikely to be further affected by the abolition of personal exemptions though, as these used to phase-out at certain income levels anyway. To help you assess the full impact of changes on your assignees’ salaries, ECA’s tax calculator and tax reports will be updated to reflect the tax reform, and other relevant changes, at the end of the month. Clear and comprehensive tax reports are available for more than 100 countries as part of a subscription to ECA data and can also be bought on demand. Our Tax Calculator enables you to calculate hypotax at the touch of a button; alternatively our Consultancy & Advisory team to run tax calculations on your behalf. ECA’s hypothetical tax data is built into our various assignment calculators and cost projection tools, including our assignment management system, ECAEnterprise.